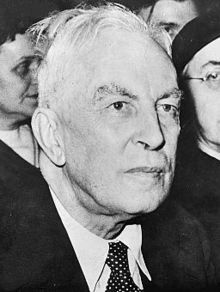 Arnold Joseph Toynbee, CH, FBA (/ˈtɔɪnbi/; 14 April 1889 – 22 October 1975) was a British historian, philosopher of history, author of numerous books and research professor of international history at the London School of Economics and King's College in the University of London. Toynbee in the 1918–1950 period was a leading specialist on international affairs. Toynbee (born in London on 14 April 1889) was the son of Harry Valpy Toynbee (1861–1941), secretary of the Charity Organization Society, and his wife Sarah Edith Marshall (1859–1939); his sister Jocelyn Toynbee was an archaeologist and art historian. Toynbee was the grandson of Joseph Toynbee, nephew of the 19th-century economist Arnold Toynbee (1852–1883) and descendant of prominent British intellectuals for several generations. He won scholarships to Winchester College and Balliol College, Oxford (Literae Humaniores, 1907-1911), and studied briefly at the British School at Athens, an experience that influenced the genesis of his philosophy about the decline of civilizations. In 1912 he became a tutor and fellow in ancient history at Balliol College, and in 1915 he began working for the intelligence department of the British Foreign Office. After serving as a delegate to the Paris Peace Conference in 1919 he served as professor of Byzantine and modern Greek studies at the University of London. It was here that Toynbee was appointed to the Koraes Chair of Modern Greek and Byzantine History, Language and Literature at King's College, although he would ultimately resign following a controversial academic dispute with the professoriate of the College. From 1921 to 1922 he was the Manchester Guardian correspondent during the Greco-Turkish War, an experience that resulted in the publication of The Western Question in Greece and Turkey. In 1925 he became research professor of international history at the London School of Economics and director of studies at the Royal Institute of International Affairs in London. He was elected a Fellow of the British Academy (FBA), the United Kingdoms national academy for the humanities and social sciences, in 1937. His first marriage was to Rosalind Murray (1890–1967), daughter of Gilbert Murray, in 1913; they had three sons, of whom Philip Toynbee was the second. They divorced in 1946; Toynbee then married his research assistant, Veronica M. Boulter (1893-1980), in the same year. He died on 22 October 1975, age 86. Toynbee was perhaps the world’s most read, translated, and discussed living scholar. His output was enormous, hundreds of books, pamphlets, and articles. Of these, scores were translated into thirty different languages....the critical reaction to Toynbee constitutes a veritable intellectual history of the midcentury: we find a long list of the period’s most important historians, Beard, Braudel, Collingwood, and so on. A Study of History was both a commercial and academic phenomenon. In the U.S. alone, more than seven thousand sets of the ten-volume edition had been sold by 1955. 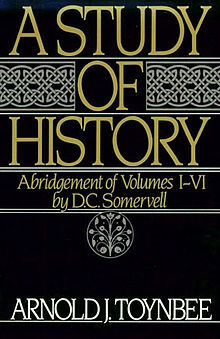 Most people, including scholars, relied on the very clear one-volume abridgement of the first six volumes by Somervell, which appeared in 1947; the abridgement sold over 300,000 copies in the U.S. The press printed innumerable discussions of Toynbee's work, not to mention there being countless lectures and seminars. Toynbee himself often participated. He appeared on the cover of Time magazine in 1947, with an article describing his work as "the most provocative work of historical theory written in England since Karl Marx’s Capital”, and was a regular commentator on BBC (examining the history of and reasons for the current hostility between east and west, and considering how non-westerners view the western world). After 1960, Toynbee's ideas faded both in academia and the media, to the point of seldom being cited today. However, his work continued to be referenced by classical historians, at least, because "his training and surest touch is in the world of classical antiquity." His roots in classical literature are also manifested by similarities between his approach and that of classical historians such as Herodotus and Thucydides. Comparative history, by which his approach is often categorized, has been in the doldrums. Yet, in Jared Diamond's book Collapse: How Societies Choose to Fail or Succeed there are similarities between Toynbee's "Challenge and Response" theory and Diamond's analysis on how elites make decisions at critical moments. For example, Diamond writes in Collapse that if the elites are insulated from problems in society and not actively engaged, they are more apt to make mistakes. Thus, Diamond may be stating that elites can not mount effective responses to challenges if their knowledge, sympathy, or own self-interest are not sufficiently the same as the broader society. Toynbee was troubled by the Russian Revolution, for he saw Russia as a non-Western society and the revolution as a threat to Western society. However, in 1952 he argued that the Soviet Union had been a victim of Western aggression. He portrayed the Cold War as a religious competition that pitted a Marxist materialist heresy against the West's spiritual Christian heritage—a heritage that had already been foolishly rejected by a secularized West. A heated debate ensued; an editorial in The Times promptly attacked Toynbee for treating communism as a "spiritual force". Toynbee was a leading analyst of developments in the Middle East. His support for Greece and hostility to the Turks during World War I had gained him an appointment to the Koraes Chair of Modern Greek and Byzantine History at King's College, University of London. However, after the war he changed to a pro-Turkish position, accusing Greece's military government in occupied Turkish territory of atrocities and massacres. This earned him the enmity of the wealthy Greeks who had endowed the chair, and in 1924 he was forced to resign the position. "population’s human rights to their homes and property over-ride all other rights in cases where claims conflict." He did concede that the Jews, "being the only surviving representatives of any of the pre-Arab inhabitants of Palestine, have a further claim to a national home in Palestine." But that claim, he held, is valid "only in so far as it can be implemented without injury to the rights and to the legitimate interests of the native Arab population of Palestine." In 1972, Toynbee met with Daisaku Ikeda, president of Soka Gakkai International (SGI), who condemned the "demonic nature" of the use of nuclear weapons under any circumstances. Toynbee had the view that the atomic bomb was an invention that had caused warfare to escalate from a political scale to catastrophic proportions and threatened humanity's very existence. In his dialogue with Ikeda, Toynbee stated his worry that humankind would not be able to strengthen ethical behavior and achieve self-mastery "in spite of the widespread awareness that the price of failing to respond to the moral challenge of the atomic age may be the self-liquidation of our species." The two men first met on 5 May 1972 in London. In May 1973, Ikeda again flew to London to meet with Toynbee for 40 hours over a period of 10 days. Their dialogue and ongoing correspondence culminated in the publication of Choose Life, a record of their views on critical issues confronting humanity. The book has been published in 24 languages to date. Toynbee also wrote the foreword to the English edition of Ikeda's best-known book, The Human Revolution, which has sold more than 7 million copies worldwide. An exhibition celebrating the 30th anniversary of Toynbee and Ikeda's first meeting was presented in SGI's centers around the world in 2005, showcasing contents of the dialogues between them, as well as Ikeda's discussions for peace with over 1,500 of the world's scholars, intellects, and activists. Original letters Toynbee and Ikeda exchanged were also displayed. The Toynbee Prize is an honorary award, recognizing social scientists for significant academic and public contributions to humanity. Currently, it is awarded every other year for work that makes a significant contribution to the study of global history. The recipients have been Raymond Aron, Lord Kenneth Clark, Sir Ralf Dahrendorf, Natalie Zemon Davis, Albert Hirschman, George Kennan, Bruce Mazlish, John McNeill, William McNeill, Jean-Paul Sartre, Arthur Schlesinger, Jr., Barbara Ward, Lady Jackson, Sir Brian Urquhart, Michael Adas, Christopher Bayly, and Jürgen Osterhammel. Toynbee's ideas feature in the Ray Bradbury short story named "The Toynbee Convector". He appears alongside T. E. Lawrence as a character in an episode of The Young Indiana Jones Chronicles, dealing with the post-World War I treaty negotiations at Versailles. He receives a brief mention in the Charles Harness classic, The Paradox Men (a working title was Toynbee 22). Frederick Buechner mentions him in the 1957 novel The return of Ansel Gibbs. Most versions of the Civilization computer game refer to his work as a historian. Toynbee receives mention in Pat Frank's post-apocalyptic novel Alas, Babylon. A character in the P. Schuyler Miller short story "As Never Was" adopts the name Toynbee "out of admiration for a historian of that name". He is mentioned in the Tom Robbins novel, Another Roadside Attraction. The Toynbee tiles may be a reference to Toynbee. ^ Orry, Louise (1997). Arnold Toynbee, Brief Lives. Oxford: Oxford University Press. p. 537. ISBN 978-0198600879. ^ a b "King's College London - Classics at King's". ^ Clogg, Richard (1985). "Politics and the Academy: Arnold Toynbee and the Koraes Chair". Middle Eastern Studies. 21 (4): v–115. JSTOR 4283087. ^ Toynbee, Arnold J. (1922). The Western Question in Greece and Turkey: A Study in the Contact of Civilisations (PDF). London: Constable and Company Ltd.
^ "Toynbee, Arnold Joseph". Who Was Who. Oxford University Press. 1 December 2007. doi:10.1093/ww/9780199540891.001.0001 (inactive 7 March 2019). Retrieved 14 October 2018. ^ McNeill, William H. (1989). Arnold J. Toynbee: A Life. New York: Oxford University Press. p. 124. ISBN 9780195058635. ^ Kennan, George F. (1 June 1989). "The History of Arnold Toynbee". The New York Review of Books. Retrieved 23 July 2014. ^ Montagu, M. F. Ashley, ed. (1956). Toynbee and History: Critical Essays and Reviews. Boston: Porter Sargent. p. vii. ^ "The Psychology of Encounters—Arnold Toynbee: The World and the West: 1952". BBC Radio 4. The Reith Lectures. 14 December 1952. Retrieved 8 April 2014. ^ Massolin, Philip Alphonse (2001). Canadian Intellectuals, the Tory Tradition, and the Challenge of Modernity, 1939–1970. University of Toronto Press. p. 162. ISBN 978-0802035097. ^ Curtius, Ernst Robert (1953). European Literature and the Latin Middle Ages. Princeton University Press. ISBN 978-0691018997. ^ McIntire, C. T.; Perry, Marvin, eds. (1989). Toynbee: Reappraisals. University of Toronto Press. ISBN 978-0802057853. ^ Perry, Marvin (1996). Arnold Toynbee and the Western Tradition. American University Studies—5—Philosophy. 169. New York: Peter Lang. ISBN 978-0820426716. ^ Gruen, Erich S., ed. (1970). "Rome on the Brink of Expansion". Imperialism in the Roman Republic. European Problem Studies. Holt, Rinehart and Winston. Intro, page 10. ISBN 978-0-030-77620-5. ^ "Is a History of Humanity Possible?". University of Oxford History Podcasts. Retrieved 1 July 2014. ^ Cohen, Deborah (Fall 2001). "Comparative History: Buyer Beware" (PDF). GHI Bulletin. No. 29: 23–33. Archived from the original (PDF) on 28 March 2013. Retrieved 8 April 2014. ^ McNeill, William H. (1989). Arnold J. Toynbee: A Life. New York: Oxford University Press. ISBN 9780195058635. ^ Brewin, Christopher (1995). "Arnold Toynbee, Chatham House, and Research in a Global Context". In Long, David; Wilson, Peter (eds.). Thinkers of the Twenty Years' Crisis: Inter-War Idealism Reassessed. Oxford University Press. pp. 277–302. ISBN 9780198278559. Retrieved 11 April 2014. ^ Brody, J. Kenneth (1 October 1999). The Avoidable War—Volume 2: Pierre Laval and the Politics of Reality, 1935–1936. Transaction Publishers. ISBN 978-0765806222. ^ McNeill, William H. (1989). Arnold J. Toynbee: A Life. New York: Oxford University Press. Chapter 8. ISBN 9780195058635. ^ Paquette, Gabriel B. (June 2000). "The Impact of the 1917 Russian Revolutions on Arnold J. Toynbee's Historical Thought, 1917–34". Revolutionary Russia. 13 (1): 55–80. doi:10.1080/09546540008575717. ^ McNeill, William H. (1989). Arnold J. Toynbee: A Life. New York: Oxford University Press. pp. 223–4. ISBN 9780195058635. ^ "This is how we ruined Toynbee's theory". Haaretz. 24 January 2007. Retrieved 19 December 2014. ^ Toynbee, Arnold J (1961). "Jewish Rights in Palestine". The Jewish Quarterly Review. 52 (1): 1–11. doi:10.2307/1453271. JSTOR 1453271. ^ Zeitlin, Solomon (1961). "Jewish Rights in Eretz Israel (Palestine)". The Jewish Quarterly Review. 52 (1): 12–34. doi:10.2307/1453272. JSTOR 1453272. ^ "Prof. Toynbee Rebuked by U.S. Scholar for Renewed Attack on Jews". December 1961. ^ "Choose Life—Arnold Toynbee and Daisaku Ikeda" Exhibition Opens in Hiroshima". Soka Gakkai International. 23 July 2005. Archived from the original on 21 September 2013. Retrieved 13 April 2014. ^ Ikeda, Daisaku (2004). The Human Revolution. Santa Monica: World Tribune Press. Preface. ISBN 978-0915678778. ^ "Thirtieth Anniversary of Toynbee-Ikeda Dialogue". SGI Quarterly. January 2003. Retrieved 13 April 2014. ^ Toynbee, Polly (19 May 1984). "The Value of a Grandfather Figure". Manchester Guardian. ^ Arnold J. Toynbee (1947). A Study of History: Abridgement of Volumes I to VI. Oxford University Press. p. 273. ISBN 9780199826698. ^ Graeme Snooks (2002). The Laws of History. Taylor & Francis. p. 91. ISBN 9780203452448. ^ Arnold J. Toynbee (1987). A Study of History: Volume I: Abridgement of. Oxford U.P. p. 570. ISBN 9780195050806. ^ "The Toynbee Prize Foundation". Toynbee Foundation. Retrieved 14 April 2014. ^ "The 2017 Toynbee Prize Lecture: "Arnold Toynbee and the Problems of Today" (Jürgen Osterhammel) | Toynbee Prize Foundation". toynbeeprize.org. Retrieved 25 January 2017. Brewin, Christopher. "Arnold Toynbee, Chatham House, and Research in a Global Context", in David Long and Peter Wilson, eds. Thinkers of the Twenty Years' Crisis: Inter-War Idealism Reassessed (1995) pp. 277–302. Hutton, Alexander. "‘A belated return for Christ?’: the reception of Arnold J. Toynbee's A Study of History in a British context, 1934–1961." European Review of History: Revue europeenne d'histoire 21.3 (2014): 405–424. McNeill, William H. Arnold J. Toynbee: a life (Oxford UP, 1989). The standard scholarly biography.